Everything you need to know about the Southern 100 course can be found right here…. Following the success of George Costain and Derek Ennett at the 1954 Manx Grand Prix, the Southern Motor Cycle Club proposed that a motorcycle circuit be used in the South of the Isle of Man and centred close to the town of Castletown. Using the newly-built Castletown A5 by-pass and the roads close by, it was initially met with a lukewarm response and a request for financial assistance from the Tynwald Government was rejected. However, the input of finance from local businessman TH Colebourn ensured that the first races could take part in July 1955 with the start and finish based, as it is now, on the main A5 by-pass. The circuit chosen measured 4.25-miles in length was pretty much a square in layout and remains exactly the same today, passing through the parishes of Arbory and Rushen. 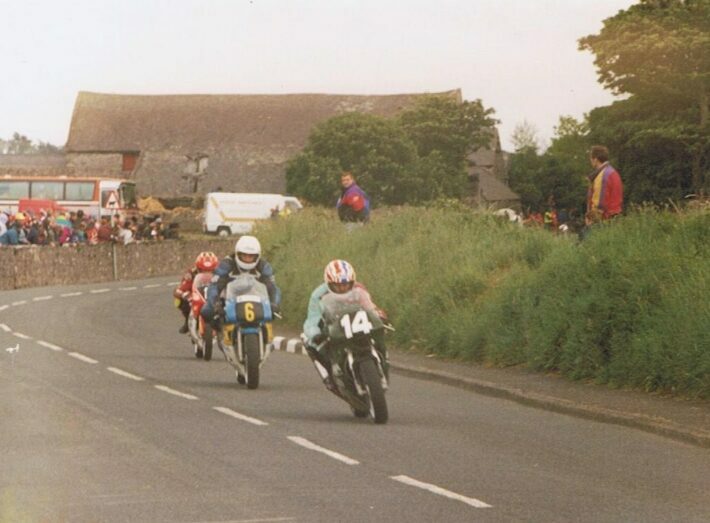 Upon leaving the start and finish, the riders have a high speed run down to the first corner, Ballakeighan, where the course turns right along the A28 Castletown to Ballabeg road where Iron Gate, Joey’s Gate and Ballanorris are negotiated. Joey’s Gate is so named after Joey Dunlop suffered a broken steering damper at this previously un-named section in 1979, resulting in him heading for an open gateway into the field where he jumped off the bike, fortunately without injury. Once Ballanorris has been taken, riders are faced with a tight right hand hairpin at Ballabeg where the course joins the A7 Ballasalla to Port Erin road. After Ballabeg, the course takes a high speed, and narrow, run through Ballawhetstone, Williams Corner and the ferocious Billown Dip before approaching another right hand, slightly quicker hairpin, this time at Cross Four Ways where the circuit joins the A3 Castletown to Ramsey road. Immediately after Cross Four Ways comes the right-left combination of Church Bends and from there it’s a fast run through Great Meadow and Stadium Bend before getting back on the brakes for the fourth slow right hander on the course, this time Castletown Corner which gives riders the ideal opportunity for a late outbraking and overtaking attempt. Billown is renowned for being extremely fast (the current lap record is just under 115mph) but also extremely bumpy. That, combined with the narrowness of the course and the close proximity of numerous stone walls makes it extremely dangerous and there’s little margin for error. Indeed, many riders breathe a sigh of relief once the first lap is completed as by then the group has stretched out a bit and the chances of a pile-up are significantly diminished. Over the years, many of the International road racing stars have competed at Billown, like Joey, Robert, William and Michael Dunlop, Guy Martin, Ian Lougher, Ryan Farquhar and Jason Griffiths but, equally, many have opted not to contest it including John McGuinness, Bruce Anstey and Ian Hutchinson. The meeting and the organising Southern 100 Motor Cycle Racing club has established a reputation of being one of the friendliest of its kind and also one of the most efficient and best organised with practice sessions and races running like clockwork. Now you know the Southern 100 course, it’s time to check out the surroundings including popular pubs, restaurants and shops. Check out our Southern 100 gallery!